In a tough all master quad, it was NM Ian Harris who defeated the top two seeds to emerge as the surprise winner! Meanwhile, NM Alex Eydelman completed a convincing 3-0 sweep in the second quad of the night. In the second clean sweep of the night, Connor Riddell won his section by a full point and a half ahead of the nearest competition. 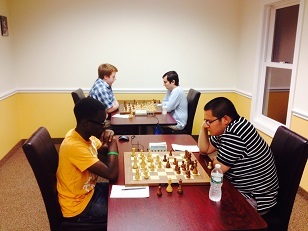 The last section was a three game match between Al Pinto and Ellen Rosenfeld. Pinto took an early lead winning both of the first games. Rosenfeld did not let the psychology get the better of her and struck back to win the final game of their match.